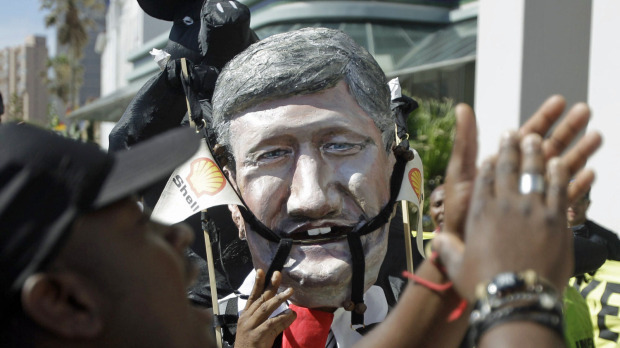 An environmental protester at the Durban Conference mocks Canadian Prime Minister Stephen Harper. According to CJOB in Manitoba, Canada’s Environment Minister Peter Kent has informed delegates at the Durban climate talks in South Africa that Canada will not renew its commitment to the Kyoto Protocol that would run from 2013 to 2017. The Tories have long argued that adhearing to the Kyoto Protocol would have lasting impacts on the Canadian economy that would stifle economic growth, and risk plunging Canada into the kind of economic recession seen south of the border. Stephen Harper has also long believed that any international agreement that does not bring on board the major polluters in the United States, China, and India is meaningless. And rather than see an opportunity for Canada to be a global leader in the fight against climate change, it is more economically and politically expedient for the Conservative government to abandon the process altogether. According to CJOB, “Canada is among those pushing for a single agreement to replace Kyoto that would include all countries.” What Canada is doing to strive towards that goal remains unclear, and, under the talking head that is Peter Kent, likely will be unsubstantial.